A few weeks ago I noticed a volunteer potato plant in one of my raised beds. I’m clearly bad at harvesting potatoes, because I haven’t planted any since 2016 and last year I also had a small crop of potatoes that grew themselves. Although it’s a rather so-so variety I’m still looking forward to them, because any spuds cooked and eaten immediately after harvest are better than shop-bought. Growing at least a little of my own food (deliberately or accidentally) is one way I connect to my forebears. For them it was an absolute necessity, but I think most of them also took pleasure and pride in cultivating their gardens and allotments. In this age of supermarket abundance I have no need to grow edibles, but nothing tastes as good as a plate of vegetables you’ve sown, nurtured and harvested yourself. 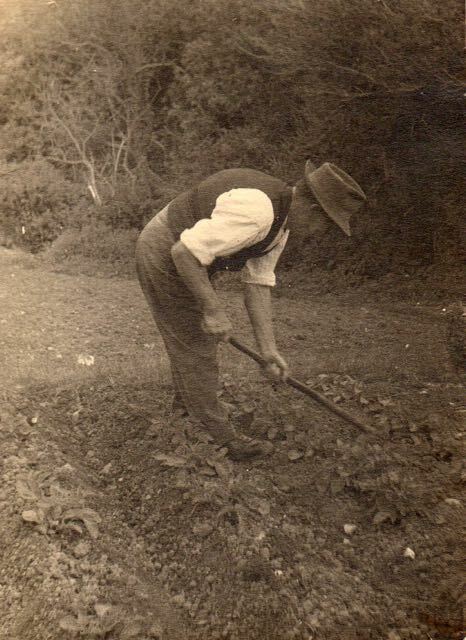 Here’s a photo of my Great Grandfather Curtis earthing up potatoes at his allotment. I don’t know the date, my best guess would be in the 1930s. As well his full-time, long-hours job as a woodsman on a country estate, Grandad Curtis cultivated a large garden and three allotments to provide food for his large family. The children were expected to assist with the gardening and other chores and in doing so they learnt many useful life skills. 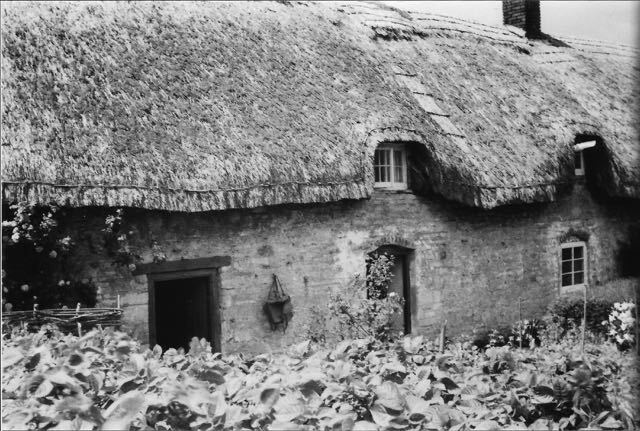 Here a bed of potato plants in front of my maternal grandparents’ cottage in the 1950s. I remember Gran’s garden with great fondness. It’s one of my happy places. Perhaps I’ll describe my memories in more detail in another post. I have a lot of them! My parents probably didn’t absolutely need to grow vegetables and fruit, but it undoubtedly helped the family budget and provided us with better quality food than could be bought. My brother and I were encouraged, though not obliged, to help and thus the urge to garden passed on to us. It’s also evident in the next generation, my nephew wants to be a farmer. I hope he can achieve his ambition. 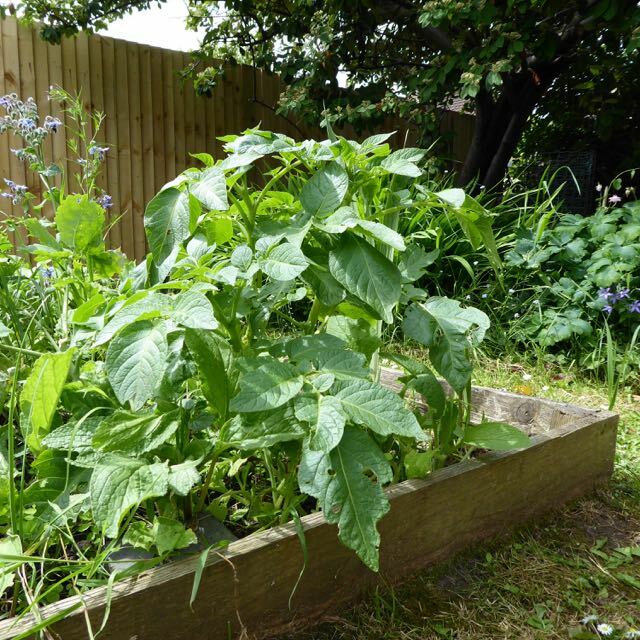 This entry was posted in family history, gardening and tagged family history, gardening, home-grown, potatoes. Bookmark the permalink.